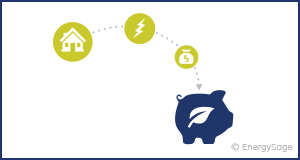 Energy efficiency helps you save money and protect against rising utility costs. However, your long-term energy efficiency savings depends on a few major factors, including your property’s current efficiency, your electricity rates, and the financial incentives available in your area. Perhaps the most important question as you consider energy efficiency upgrades for your home or business is, how efficient is your property right now? If you have appliances that are 20+ years old, drafty windows, or a furnace or central air conditioning system in need of replacement, you can see significant energy efficiency savings by making updates. Even if your home or business isn’t in need of significant upgrades, energy-efficient appliances can still offer net savings in the form of reduced energy bills. If you live somewhere with high electricity rates compared to other regions, your savings will be higher when you conduct energy efficiency measures at your property. Many of the regions in the U.S. with high electricity rates, like the Northeast and southern California, also have high heating or cooling needs, which means that property owners in those areas will realize additional savings with appropriate energy efficiency projects. Depending on where you are located, you may be able to access state, local, or utility rebates that will decrease your out-of-pocket costs for energy efficiency projects. The specific incentives available vary from program to program, but could include rebates for purchasing new energy-efficient appliances, air conditioning systems, or furnaces; recycling old appliances; and upgrading leaky windows or insulation. Many programs also offer low- or no-interest energy efficiency loans. Calculating energy efficiency: How much would you save? The returns you see on energy efficiency upgrades at your property are dependent on each of the factors listed above, as well as the type of project that you decide to conduct. Below are two examples of common energy efficiency upgrades that property owners can make for their home or business. In each example, we compare the lifetime cost of buying and using a new non-ENERGY STAR rated product against a new energy-efficient ENERGY STAR product. These calculations assume an electricity rate of $0.12 per kilowatt-hour (kWh) and a 3% annual electricity rate increase. By purchasing an ENERGY STAR certified refrigerator rather than a non-energy efficient refrigerator, you could save $135 over your refrigerator’s 12-year lifespan. By purchasing an ENERGY STAR certified central air conditioner rather than a non-energy efficient central air conditioner, you could save $1,680 over your air conditioner’s 18-year lifespan. Each of these examples is illustrative, but can give you a sense of the kind of savings to expect when you choose energy efficient appliances and products over conventional products. Your savings will be even greater if you switch out older appliances and heating & cooling systems for energy-efficient products. For example, a fridge manufactured in 1990 uses 1,100 kWh per year – more than three times as much as an energy-efficient fridge manufactured today. Assuming you pay $0.12/kWh for your electricity, you could save $90 on your electric bill by making that simple switch. To get a fully customized understanding of the opportunities for energy efficient upgrades, look into getting a home energy audit for your home or business. Energy efficiency measures can help insulate your home against rising electricity prices. To take it a step further, consider installing solar panels on your property so that you can generate your own renewable electricity. Installing solar panels on your roof is the best way to ensure that your electricity prices will remain stable over the course of the next 20+ years. 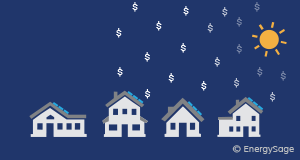 The cost of solarizing your property is lower than ever, with prices falling below $10,000 for an average-sized 5 kilowatt (kW) system in many areas of the country. As with energy efficiency, there are also significant solar incentives and rebates available to help homeowners and businesses make the switch to renewable energy. The most significant of these is the federal investment tax credit (ITC) for solar, which reduces your total costs by 30 percent. You can “go solar” with a $0 down solar loan and pay off your system in seven years or less, at which point you’ll enjoy free electricity for the remainder of your solar panels’ 25+ year lifetime. In many cases, solar energy savings reach tens of thousands of dollars – and when you pair solar with energy efficiency measures, you’ll be even less reliant on your utility for your electricity needs. For this scenario, we assumed a monthly electric bill of $100, and an annual electricity rate increase of three percent. The net installation cost equals the total cost of going solar minus the 30 percent federal tax credit for solar. This example is illustrative – as with energy efficiency, your savings with solar are dependent on electricity rates and incentives in your area, as well as the financing option you choose.